Traditional German dessert recipes are timeless. Pastries, puddings and cakes are abundant, delicous, and they are definitely worth a sin. Discover your sweet tooth with easy dessert recipes and tempting German cakes for special events. Apple strudel, black forest cake, light fruit tarts are well-loved and all-time favourites. 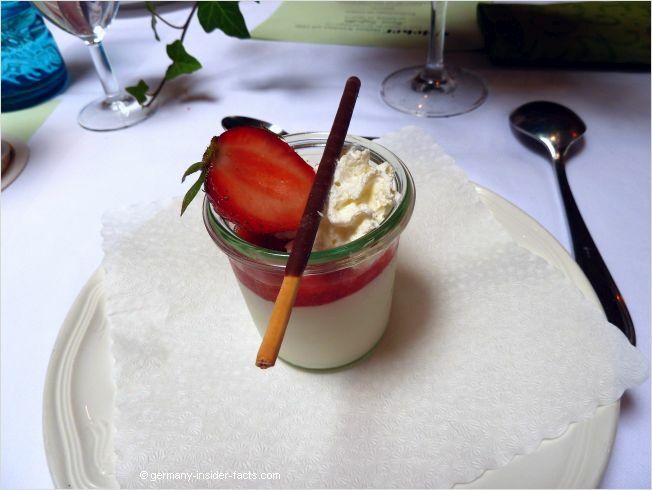 We Germans love a sweet dish at the end of a meal, even if it is just a light fruit salad, an ice cream, or a pudding. 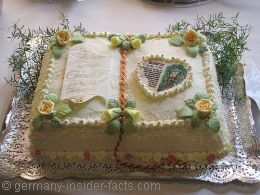 German women (and men) are great pastry chefs, and proud of their treasure trove of traditional German cake recipes. Some recipes are very old, and handed over within families for generations. I clearly remember those Saturdays when mom put the food processor on the kitchen table to make the Sunday cake. I was always surprised that she knew most recipes by heart. Okay, for a regular weekend the recipes were quite simple. It was a fruit tart in summer to use the berries from the garden. During winter time she often made a marble cake. Oh, and I definitely remember the lovely smell when the cake came out of the oven. We knew it was weekend then and we wished it were Sunday afternoon already. Even if I am rather full after a meal, a pudding is a light dessert that always fits. Puddings are amongst the easy dessert recipes that don't require a lot of effort. The quickest way to make a pudding is to take advantage of convenience products. Pudding powders are available with various flavours. Vanilla, chocolate and caramel are definitely my favourites. Cook the pudding according to the instructions, rinse a pudding mould in cold water, and fill in the hot pudding. Refrigerate a couple of hours. Loosen the pudding along the edges and turn it on a plate. Decorate with fresh fruit and serve with vanilla or chocolate sauce. If you want a creamy pudding, add beaten egg whites or whipping cream when the pudding has cooled, and you have a delicious & creamy pudding dessert. 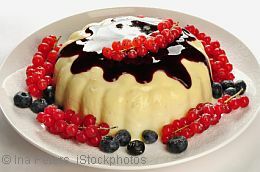 Red Fruit Pudding - Rote Grütze, originally a specialty of the northern states, it is a favourite in the entire country. German cakes can be anything from a quick fruit cake (Obstkuchen) to an opulent gateau (Torte). Look at this amazing Torte in the picture! My sister in law made it for my mum's 80th birthday. I didn't even dare to ask for the recipe yet, it looks like so much work. However, the result is scrumptious. You might know that Germany, and many European countries, use the metric system. In my opinion using metric weights is the most accurate way to describe recipes. Although I give info for American cups on the recipe's ingredients lists, I am not sure if my converting of recipes is always correct. So, for the best results, get a digital kitchen scale. I like those with a flat surface that can hold a bowl to add your ingeredients. Check out this fairly good Digital Kitchen Scale from Amazon.com. Remember, measuring in cups depends on the density of the ingredients. Different sorts of sugar and flour have different densities. One cup of wholemeal flour is not the same as one cup of plain flour. Here is more information about gram to cup conversion. If a recipe doesn't work for you, please let me know. I try to be as correct as possible, but sometimes a typo, or inaccurate conversion might happen. Would you believe there are people who don't like sweet desserts? 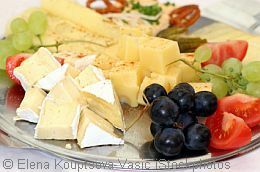 According to the saying "Käse schliesst den Magen" (cheese closes the stomach), they prefer a cheese dessert. From the traditional cheese platter to fried camembert & Bavarian Obatzter, the range of cheese desserts is wide. Other beloved German desserts include ice cream, fruit salads and jam doughnuts (Kreppel, Berliner). 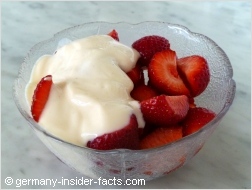 Fresh strawberries and a light vanilla yoghurt is one of my favourite desserts on a hot summer day.